Splash Zoo in the LEGOLAND California Waterpark is beyond adorable. 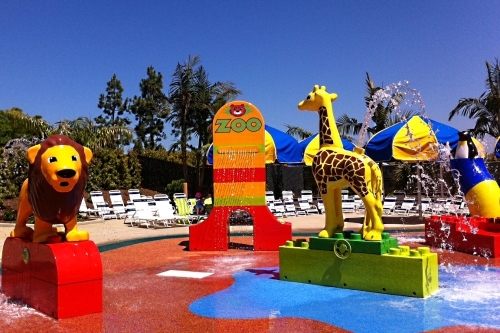 This new water play area is outfitted with DUPLO animals (a lion, a zebra, a giraffe, a polar bear, and two penguins). Each animal has an interactive feature, like a wheel on the giraffe that makes water spout from its mouth and ears. A seesaw sprays riders when toddlers make it teeter up and down. There’s also a crawl-through tunnel and a fountain that shoots water 25 feet in the air. Although built specifically for children ages 1 to 3, there were plenty of other kids splashing around in the Splash Zoo on its opening day. At first my 6-year-old balked at this attraction being “for babies” but after she saw other big kids hamming it up on the water features, she joined in the fun. Located near numerous lounge chairs and a handful of rent-able shaded cabanas, this attraction makes a great spot for parents to chat and relax without worry while little ones play since there is no pool of water here – just fountains galore. Nearby is Splash Safari with its child-sized waterslides and Kid Creek, a mini lazy river built just for children. Life vests are available for kids of all ages at LEGOLAND Water Park, so really, I could have brought both and managed just fine. To be honest, I was craving a mommy-daughter day. It turns out, Karissa must’ve wanted a special day for just the two of us too. She told me she loved me (unprompted) at least 10 times that day, while splashing at the water park or standing in line for the rides in the amusement park. To make the most of your visit, check out these LEGOLAND California Tips for All Ages from Babies to Teens or my LEGOLAND Hotel Review now. 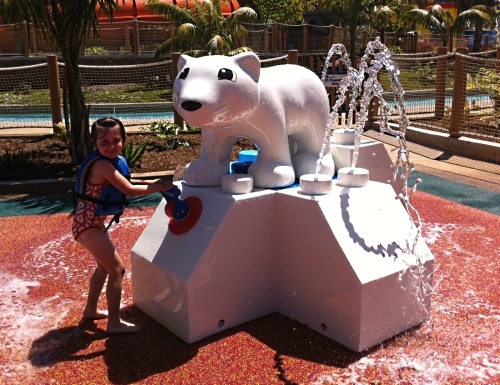 For more splashy fun, read a full review of LEGOLAND Water Park now. 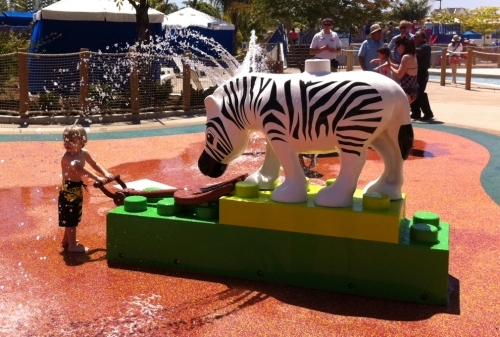 What’s your favorite LEGOLAND attraction? Share your thoughts in the comments! A Note from The Travel Mama: My daughter and I received free one-day entrance to LEGOLAND California and the LEGOLAND Water Park. I always share my honest opinions, no matter who pays! It’s amazing to see what can be made with Legos. Those designers really know how to make kid-appealing attractions.